The weather and intelligence station is home to fewer than 200 people, all of whom have been sent their as part of their jobs, whether they’re members of the Armed Forces, civilian contractors or Environment Canada employees. The people living at CFS Alert, Canada's northernmost military outpost, are there for one main reason — to work. The weather and intelligence station is home to fewer than 200 people. All of them were sent there as part of their jobs, whether they're members of the Armed Forces, civilian contractors or Environment Canada employees. At roughly 82-degrees north, the station is 800 kilometres north of Grise Fiord, Nunavut, the closest community. It's roughly the same distance from Alert to the North Pole. It's a unique work environment on the Arctic Coast. In the summer, there's 24 hours of sunlight, in the winter, 24 hours of darkness. In the winter, the temperature drops well below -50 C and in the summer, icebergs float in the harbour. In fact, there's someone who's responsible for keeping the station safe from polar bears who roam too close to the base. Earlier this summer, Defence Minister Harjit Sajjan visited the station as part of his tour of northern military facilities, highlighting $10 million upgrades to infrastructure and equipment at the facility. Here's a look at life on the base from three people who live and work there. As the station's warrant officer, Patrick Marceau is responsible much of day-to-day goings on at the station. That includes controlling the wildlife around the station — which often means polar bears. When someone at the station spots a bear, they give Marceau a call on the radio. He goes out with another person and a shotgun to take a look and scare off the bear. Meanwhile, everyone else waits inside for the bears to clear out. So far, he's had to do this about eight times. During Sajjan's tour of the base, he spotted three polar bears out on the ice, about 500 metres away from shore. "It's very exciting to see wildlife here on station," Marceau said. "We live in their environment. It's just to make sure that we're safe in the area. Now the ice has moved in, that attracts seals and polar bears as well." Marceau is midway through his six-month tour at the station. He's usually based in Ottawa and has noticed a huge difference between life at headquarters and in the North. "It's very unique," he said. "Who would have thought I'd have the chance to do something like this in my career?" When Master Cpl. Arthur Melanson arrived in Alert a few months ago, from Shelburne, N.S., he made sure to bring his bagpipes. It turns out he is the only person there right now who knows how to play, making him the resident piper for special occasions. For Melanson, Alert's remote location often makes him feel like he lives in the middle of nowhere. He's also partway through his six-month tour at Alert. Generally, his life is structured, following a set routine each day. He works at his job as a radio operator from 8 a.m. until 4 p.m. followed by a workout at the gym and meals. But in the evenings, he says that's when the station's social life begins. "Every night there's some sort of activity," he said. "Sometimes it's cards or there's a movie, a talent show, sports, whatever you want." He also spends a lot of his free time exploring the area around the base out on the land, which is completely undeveloped outside the station. "It's pretty awesome," he said. "The landscape is pretty untouched, we go hiking a lot. We've been up most of the mountains around here. But the 24-hour sunlight takes a bit to get used to. We go to bed, the sun's high in the sky, you wake up at six and the sun's high in the sky." "It's no different than being on exercise or being deployed anywhere else, other than the weather" Melanson said. "It's a bit cold in the summer, when the sun's up, but that's about it." No matter the weather, Renee Cossitt or one of her teammates leaves the station's buildings four times a day to release weather balloons for Environment Canada. "I joined Environment Canada because I love the environment, so getting to go out and go hiking and getting to explore this beautiful place is great," she said. "It's pristine." 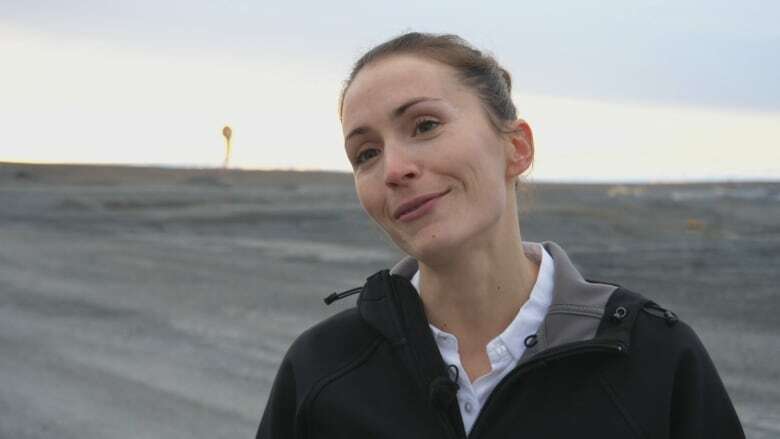 She works with the atmospheric monitoring program at Alert, which takes readings of the Arctic atmosphere. Team members collect data about how pollutants interact with the ocean and biosphere, collecting information about climate change in one of the fastest-warming places in the world. "Our work is very important, it gives researchers really necessary data to allow researchers to forecast, do their research and give everybody a heads up about what's going on up here," Cossitt explained. People across Canada do similar work but Cossitt is responsible for getting the job done in one of Canada's remotest places. "I love it, I've really been enjoying my time here. It's a great place to come up and visit and work in," she said. "We have environments you don't get to see very often or experience. "It's an adventure and I get to work and live here."